President Donald Trump ordered U.S. troops to leave Syria on Wednesday, as the White House declared victory over the Islamic State. The announcement was met with backlash from Capitol Hill, including from the president's usual Republican allies, who expressed concerns about what the move could mean for the U.S. and its allies. U.S. troops have not yet begun moving out of Syria because military plans for how the withdrawal will occur are still being finalized, a U.S. official told ABC News. Those plans will ultimately be presented to Defense Secretary James Mattis for his approval. Once that occurs, it is expected that U.S. troops will begin leaving Syria with the expectation that they will all be out 30 days later. Why did the U.S. go into Syria in the first place? The first U.S. troops arrived in Syria under the Obama administration in Oct. 2015 to push back ISIS. At its peak, ISIS controlled territories across Iraq and Syria that were home to about 10 million people. Fifty American advisers were initially sent to Syria. That number grew to more than 500, according to the Pentagon, before officials acknowledged there were approximately 2,000 U.S. troops in Syria. 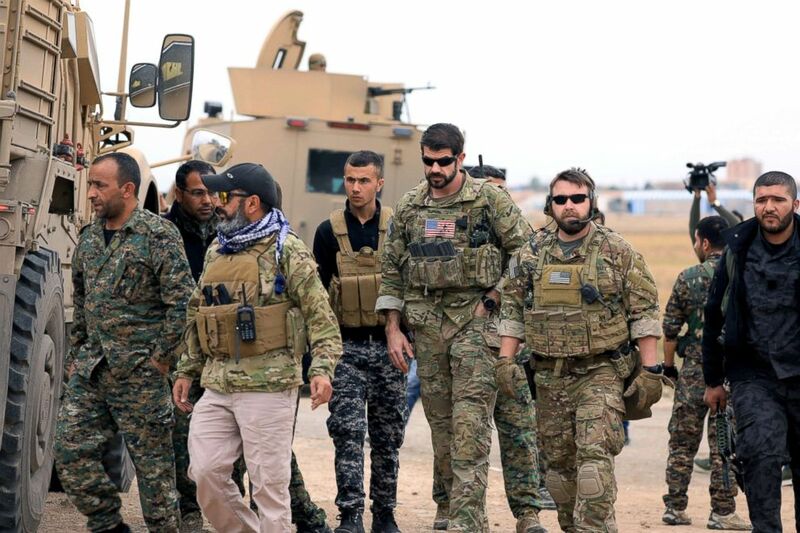 The role of the U.S. troops has been to advise and assist the Syrian Democratic Forces (SDF) -- a Kurdish-led force that now numbers more than 50,000 and is about 40 percent Arab. The U.S. is not involved in direct combat unless it is for self-defense. Syrian Democratic Forces and U.S. troops conduct a patrol near Turkish border in Hasakah, Syria, Nov. 4, 2018. The SDF has become America’s main fighting force against ISIS and, with the help of coalition airstrikes, has retaken the Syrian cities that had fallen to ISIS including Raqqa, which was the terrorist group's self-declared capital of its caliphate. Those ground victories have pushed ISIS into a small corner in eastern Syria close to the border with Iraq, leaving them with less than 1 percent of the territory they once controlled. Earlier this year, the SDF launched its final push to defeat the last ISIS holdouts in the easternmost part of Syria along the Euphrates River. That fight has stalled due to heavy ISIS resistance and concerns about the Turkish military launching operations against the SDF. What are the security consequences of a U.S. withdrawal from Syria? Critics of Trump's decision to withdraw forces from Syria have cited several concerns, chief among them: the future of ISIS, the Syrian civil war and the Kurds. Though the U.S. and its partners have retaken most of ISIS-held territory and significant numbers of ISIS fighters have died in the fighting, the group is still estimated to have 2,000 fighters in Syria. Despite Trump's declaration that ISIS has been "defeated," State Department and Pentagon officials had cautioned -- as recently as last week -- that the fight is not over, as the coalition and SDF continues offensive operations against ISIS in the city of Hajin. 5th Special Forces Group Operation Detachment Bravo 5310 arrives to meet Major General James Jarrard at the Landing Zone at base camp Al Tanf Garrison in southern Syria, Nov. 22, 2017. "It's a fight until the end, and they have a lot of booby traps and [improvised explosive devices] and suicide fighters out there," the spokesman for the coalition Col. Sean Ryan told reporters late last month. In the past, Trump has been critical of President Barack Obama's decision to withdraw troops from Iraq, which served to create a vacuum that was ultimately filled by ISIS. In Iraq, where the government claimed victory a year ago, ISIS has developed into an insurgency. The concern is that if local security forces can't hold ground in Syria, the group could not only become an insurgency, but regain its fighting strength and retake territory. The U.S. has been working to train and equip those local forces to prevent just that and stabilize the region, but Chairman of the Joint Chiefs Gen. Joseph Dunford said last week that only about 20 percent of the estimated 35,000 to 45,000 troops who are needed have been trained. There are also concerns that ISIS could once again direct and carry out terrorist attacks overseas. "While ISIS has certainly been degraded over the past two years, its leadership remains intact, and many of its fighters have dispersed ready to reform," said ABC News contributor John Cohen, the former acting undersecretary for intelligence and a former counterterrorism coordinator at the Department of Homeland Security. "How the organization reconstitutes itself is of great concern to national security experts." Could a new war break out in Syria after the U.S. pulls out? Syria has been ravaged by a seven-year civil war as rebel groups sought to overthrow Syrian President Bashar al-Assad. Over half a million people have been killed and more than five million refugees have fled Syria since the conflict began with Assad at times using chemical weapons and barrel bombs against his own people. With Russian and Iranian support, Assad’s regime has taken back control of much of western Syria from various rebel groups. 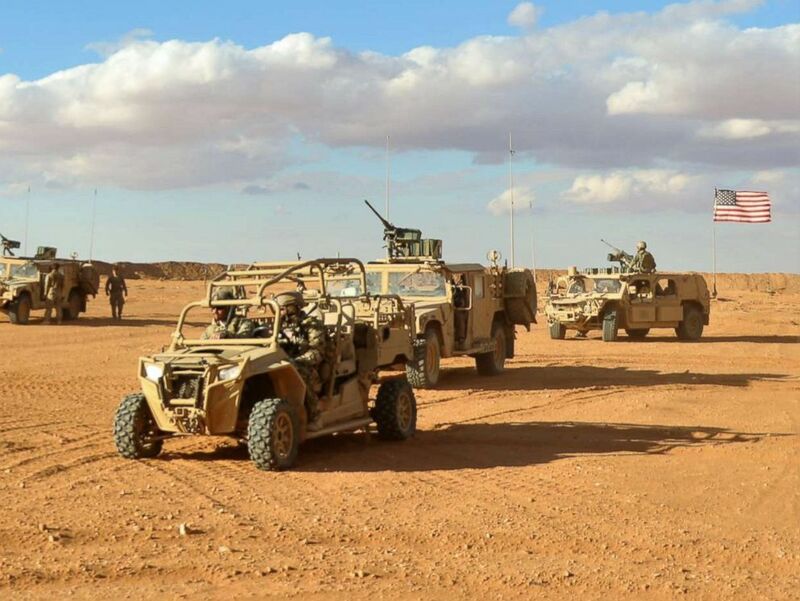 Meanwhile in eastern Syria, the U.S. and its local partner forces have concentrated on fighting ISIS, in effect creating an autonomous area not under Assad’s rule. If the U.S. pulls out, Assad and his allies could move to regain control of the country, igniting more violence in areas still working to rebuild. "By leaving Syria, its future has been handed over to Assad, Russia, and Iran, and that may not be in the best interests of the U.S.," Cohen said. A graver concern is the strong possibility that once the U.S. pulls out, Turkey will send its military into northeast Syria to target America’s Kurdish SDF partners. While the U.S. has seen the SDF as valued partners in the fight against ISIS, Turkey considers them to be an element of a Kurdish group that has launched terror attacks inside Turkey for decades. The U.S. military presence in Syria has served as a buffer against Turkey and the Kurds along the border and in the city of Manbij. Last week, Turkish President Recep Tayyip Erdogan said he would launch a military operation against the Kurds in northeast Syria "within a few days," but that hasn't yet occurred. “The Kurds who have helped us so much, been such good allies, are now exposed to be taken over by Turkey, Assad, Syria or maybe become victims of ISIS themselves,” South Carolina Republican Sen. Lindsey Graham told CNN on Wednesday. A vocal critic of Trump’s decision to pull U.S. troops from Syria, Graham has also expressed concerns that leaving the Kurds to fight alone will make it more difficult in the future to work with local partners in the Mideast in confronting radical Islamic groups. Those concerns are not lost on U.S. officials either. “Operational commanders have a concern for the security of our partners that have done everything we’ve asked of them in the fight against ISIS and their perception of this U.S. military withdrawal," a defense official told ABC News Thursday. How many American service members have been killed in Syria? Four American service members have been killed in Syria since the U.S. entered in 2015. Navy Senior Chief Petty Officer Scott Cooper Dayton, an explosive ordnance disposal technician, was killed Nov. 14, 2016 by an improvised explosive device blast in northern Syria. Dayton, 42, was from Woodbridge, Virginia. Air Force Staff Sgt. Leo Austin Bieren of the 21st Space Wing was killed on March 28, 2017 from injuries sustained during a vehicle rollover-related incident in northern Syria. Bieren, 25, was from Umatilla, Oregon. Army Spc. Etienne Jules Murphy, an Army Ranger, was killed on May 26, 2017 from injuries sustained during a vehicle rollover crash in northern Syria. Murphy, 22, was from Loganville, Georgia. Army Master Sgt. Jonathan Jay Dunbar, a member of Delta Force, was killed on May 30, 2018 by an improvised explosive device during a patrol in Manbij, Syria. Dunbar, 36, was from Austin, Texas.